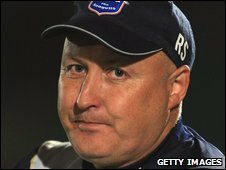 Brighton & Hove Albion have sacked manager Russell Slade after eight months in charge following their 3-3 draw with Hartlepool on Saturday. The League One club are one place above the relegation zone having won only three games so far this season. Slade, 49, was appointed manager in March after the departure of Micky Adams as the Seagulls avoided the drop. Assistant manager Dean White and first-team coach Bob Booker have also left the Withdean. Director of football Martin Hinshelwood has been put in temporary charge and will be assisted by Steve Brown and Charlie Oatway. Slade previously had spells in charge of Yeovil Town, Scarborough, Sheffield United and Grimsby Town. He told the club's website he was sad to be leaving after a relatively short spell. "I am extremely sad that things have not worked out but we have parted on good terms," he said. "I felt we were progressing through a much-needed and vital rebuilding process that was never going to be easy with the large turnover of players during the close season." Chairman Tony Bloom added: "It is not a decision we have taken lightly and one taken with a heavy heart. What do you think of the decision to sack Slade? "Russell is a good man, which made it an even harder decision to take, but it is one which has been made in the club's best interests. "Like all Albion fans I am extremely grateful for Russell's achievements at the end of last season, as he kept us in League One against the odds."